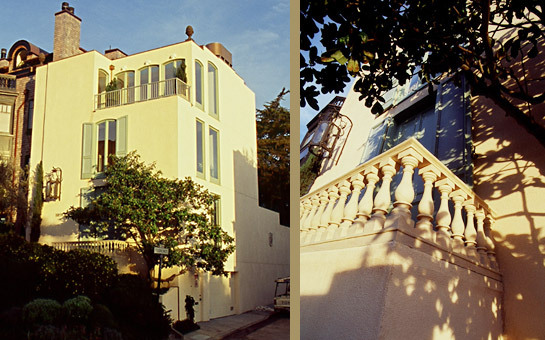 San Francisco's Russian Hill welcomes a Christl Thomson carefully orchestrated massive home renovation. The result, once again, is one of splendid elegance, in what is arguably the most sought after Russian Hill residential location. The prominent corner setting, introduced by the cascading mature olive tree in the front garden, sets the stage for the kind of house that has an aura of its own. An exquisite adult retreat completely reconstructed, with the supreme workmanship and uncompromising quality of Muratore Corp, and under Christl Thomson's trained eye for the uncommon, artfully articulated detail, inside and out. She set out not only to add a story, to rescue and revitalize, but to make it magical. That it is.with a Mediterranean architectural identity of a Roman Villa with views, terraces, balconies, garden, and pool. The 6' tall antique lantern on the exterior by the tall double sized entry doors sets the tone. Firstly, a three story high entrance hall with a curved staircase spiraling towards an oversized skylight washing the entry with light. Beyond are the finely proportioned formal settings graced by high ceilings, grandly scaled stone fireplace, limestone flooring, and floor to ceiling glass doors. The aquamarine water of the jewel-like pool is a delightful focal point on the terrace, accessed from the living room. The charming pool terrace steps down to the limestone south garden, lined with plantings of tall cypresses. A sculptural old pear tear in a corner is carefully saved for a classic signature. The living room and garden terrace opens to the chef's kitchen, perfectly planned for easy entertaining, equipped with European appliances, custom fixtures, and limestone counter tops. A glassed-in breakfast area accesses the sheltered south facing terraced garden. The high ceilings and 10' solid doors make the kitchen an elegant yet functional part of this first floor. A successfully open plan with rarefied touches of visual drama. The second and third floor, reached from the elegantly curved open staircase, draw inspiration from the first floor displaying the same gracious symmetrical proportions. Built as private versatile retreats, the Owners' suites weave a rich tapestry of careful design elements; high ceilings and doors, eyebrowed double doors opening to sunny balconies, antique fireplaces, and ample closets. Exquisite baths with large custom made brushed steel tubs, charmingly situated overlooking the park-like setting to the south. Heated floors, handplastered walls, and European brushed steel elements add to the custom luxury. Exterior electronic shades for bath and dressing room privacy, are an added comfort feature. The two top floors show a meticulous vision for a classical yet ultra modern contemporary living. Golden Gate Bridge, Bay, and City vistas delight from both levels. The highlight is the top floor master suite, which combines a view-filled sitting room, bedroom, large bath, and closet complex. Designed for additional indulgence with an outside plant-filled loggia for basking in the western views and sunsets. The massive, one of a kind fireplace achieves a dramatic impact in this supreme space of grace and comfort.